~ For the Grits ~ Using one cup of best available stone ground grits, cook per label instructions with Swanson’s low-sodium chicken broth and stir in 1/3 cup grated white cheddar cheese during the final minute of cooking. In a large non-reactive skillet over medium heat, cook onions, bell pepper and ham* in butter until onions are translucent. Deglaze the pan by using liquid to scrape up any browned bits stuck to the bottom of the pan. Cook until amount of liquid is reduced by half, then add cream and reduce to a loose sauce. Add shrimp, stir and cook until sauce consistency is reached. 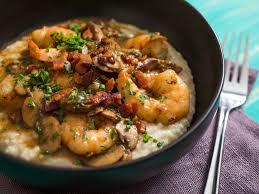 Nest, spoon grits into individual serving bowls and spoon shrimp and sauce over grits. *Note: Prosciutto or bacon may be substituted for country ham. ~ Hap and Jennie Arnold were customers of ours at our Mooresville location until his death from a stroke July 4, 2016. Hap had great passion for good food, particularly fresh seafood, and was willing to make a 50 mile trek to get it several times a year. I miss my friend. This is his rendition of a great recipe.